Modern built hall with a small hall and large hall. 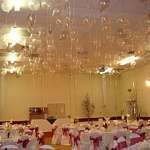 The large hall has a curtained stage and also an extending stage if required. Comfortable seating is available for up to 200 guests. 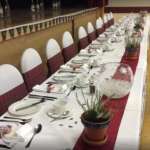 The hall has been used for wedding receptions, dinner dances, discos, highland dancing and is also used for holding PE lessons twice weekly for the local primary school. Toddlers, Overs 60’s Club, Youth Club, Indoor Bowling and Arts & Crafts. The community Christmas Party, Pensioners Party and local fundraisers are held. 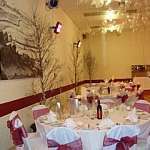 It is also used for birthday parties. 1 small hall which can seat up to approx 50. 1 large hall which can seat up to 200. We have 200 chairs and 26 tables a stage and an extending stage. Kitchen off of small hall with electric cooker and double oven, microwave, 4 x electric kettles, hot water urn, commercial dishwasher, crockery and cutlery for 200 plus. ANY CLEANING OF MORE THAN 1 HOUR BY THE HALL KEEPER WILL BE CHARGES AT THE MINIMUM HOURLY RATE PER HOUR. Use of kitchen is included in price. Table hire £5 per table per day. Cleaning of hall for 2 hours or more after function will be charged.